Saint Maurice is the patron saint of armies, soldiers, the Swiss Guard, arms makers, sword smiths and almost anyone who carries a weapon. 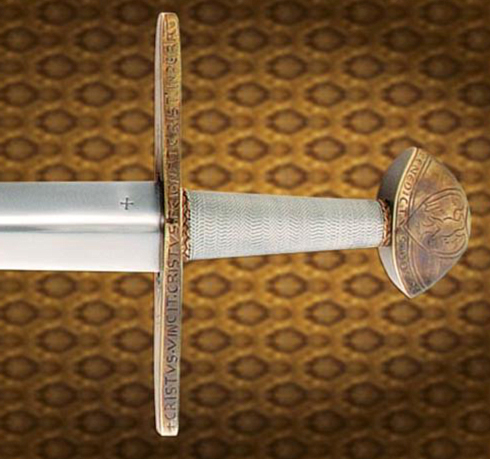 The original of this sword is housed in the Weltliche Schatzkammer (Imperial Treasury) in Vienna, and was used in the coronation of the Holy Roman Emperors from Otto IV in 1198 to Karl I in 1916. The blade is hand forged of 1095 high carbon steel, tempered and full tang. The solid brass fittings include engravings done by hand and then hand finished for an aged/antiqued appearance. The grip is wood wound with silver wire bound with brass knotwork rings. 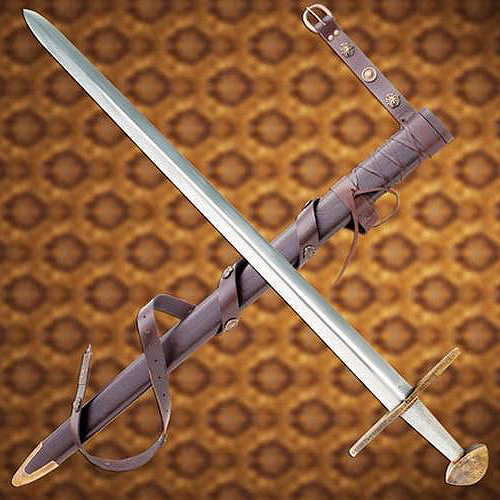 This stunning and historically significant sword includes a beautiful leather scabbard and belt set.